At the age of 8 or 10 when asked “What do you want to be when you grow up” my answer was, in no particular order, I wanted to be a designer, a poet and a crazy (I truly used that word) scientist. In my child’s mind I wanted to be all of them, not only one of them. My father instead wanted me to be a notary. In his words a way to make a lot of money without working. He tried to scare me with scenes of poor writers, lonely and homeless artists and by saying that science wasn't for girls. I do not remember what my mother wanted me to become…And, I do not remember her being particularly fond of my creative aspirations. Certainly they were trying to protect me and wanted me to have a bright future. I grew up surrounded by a narrative of art not being a real job. I grew up with the narrative that only achievers get real jobs. I dropped writing and drawing. I dropped the creative feminine energy within me. I became a perfectionist hyper-achiever. But, I took pride in proving my father wrong and got a PhD in chemistry. After all the perfectionist was (and still is) a rebel at core! The choice of studying chemistry was unconsciously my way to remain creative. I still remember with fervour the endless hours I could spend in the laboratory playing with the alchemy of elements. Unconsciously, I was training myself into the deep creative power of forging meaning and form. Consciously, I did it because I wanted to save lives. Fast forward 25 years, when the life to be saved was my own, poetry came back and saved me. It forged me into a new human being. Or, better, a more complete and fuller human being. The disease threatening my life was the same my lineage had contracted, and that is spreading more dangerously than any other pandemic I know: working harder and faster at the cost of becoming in-humane. An in-humanity praised by the society’s busyness badge of honour. An in-humanity I strived too in an attempt to affirm myself in the world. An in-humanity I sought to chase power. What I now realise, thanks to poetry, is the deep cause for such pandemic of in-humanity: the loss of heart. A heart that is banned out of the corporate rooms. 25 years later I finally found the courage to name myself a business heartist. It has been a transformative path of reclaiming my humanity, the integrity of my identity as the whole rainbow and not just one colour of it. The work I have been called to do is figuring out ways in which the whole of our humanity can work harmoniously with the whole of the world out there, with all those seemingly paradoxes, complexities and tension. It is the work of integrating and including the multitudes of facets that make us whole and learning how to express them in order to fulfil our purpose. We are called to re-claim our integrity of being whole and influence (by being influenced) the world outside without harm. It is like being back in the chemistry laboratory of my younger age, observing how the elements interact with each other, influencing the environment around them and patiently waiting for the reaction to unfold into a new molecule. Can I, you, we (because is going to take all of us) transform business through heart? Both the chemist and the poet within me know and have experienced the power of living and working at the intersection of arts, fields, experiences; the most difficult of alchemy to realise. It’s at the intersection that we find wholeness and from there we can transform and create new paradigms. 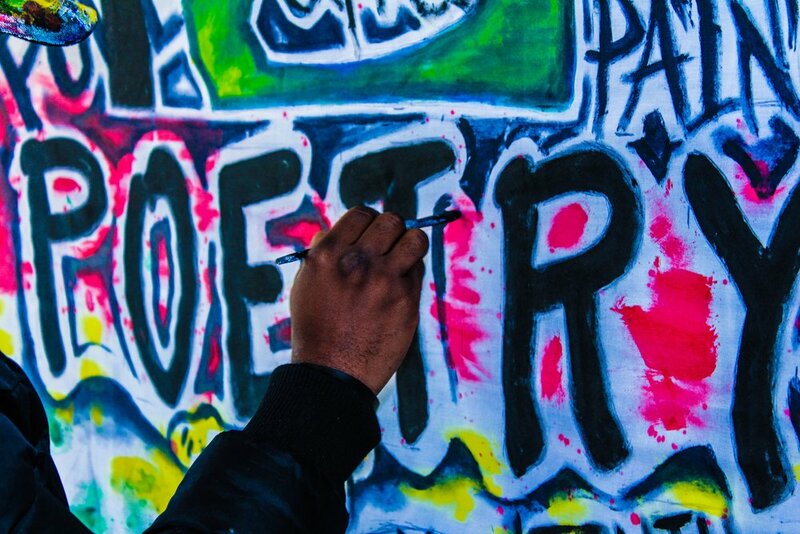 Poetry has a fundamental role to play. It offers us the opportunity to re-affirm our humanity and re-awaken our inner wisdom. It can help us remember what makes us alive…Our art… Or as I call it heart. It is not a path of artists borrowed to business to deliver inspiration or business executives borrowed to art to deliver processes. It’s the path of business heartist working at the intersection of physical, spiritual, emotional and intellectual realms. If we want to change the course business has taken we must enter the intersection (of rational and emotional, creative and logic, scientific and humanistic) and apprehend the literacy to express it. To me that is through poetry: the language of our heart. The language that makes us human. It is not the elite privilege of few. It’s that poetry sung around the fire at the origin of our human history that healed and created community. Let’s bring it back. Let’s talk business in rhyme. RNEWB offers a robust offering of talks, workshops and programs that use storytelling, poetry and heARTistry in an innovative and yet practical methodology that has helped leaders and teams to reach their goals, tap into their creativity, broaden their awareness and improve trust within the organisations they lead. For more information please visit www.rnewb.com and feel free to get in contact.